I love plums. 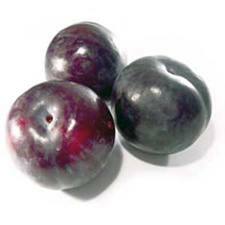 Black plums or red, I love them when they are cold and juicy, straight from the fridge. Not long ago, I bought a big bag of black plums, brought them home, washed them, and put them in a big white bowl in the fridge. I wanted them to get really cold before I ate one. They’re so good that way! I left home to run errands or some sort of mom-like activity. The boys were home alone for a few hours. I returned home, and was so hungry! I remembered the plums in the white bowl in the fridge! What a treat that would be on a sunny summer afternoon. I opened the fridge. The bowl was empty. They didn’t even bother to take the empty bowl out of the fridge. Just left it there to taunt me with its emptiness. Well, I have a recipe that uses plums, and I’m going to buy some more soon to make this, with a few extra for eating. This time, however, I’m going to hide some extras in a secret spot inside a container in the back of the fridge, where they’ll never think to look! Combine plums, cider, 1/4 cup sugar (or Splenda) and cinnamon in a medium saucepan; bring to a simmer over medium heat. Cook, stirring occasionally, until the plums are soft and falling apart, about 5 minutes. Remove from the heat. Peel and grate apples. Stir the grated apples into the plums. Spoon the compote into a large bowl and chill in the refrigerator.